They certainly add a festive touch of colour to the season. I would love to try a tuna. You may remember that,in New Zealand, Tip Top is an ice cream brand and tuna is the Maori word for eel. I have tried both of those. The Hebrew word for ‘who’ is pronounced like English me. The Hebrew word for ‘she’ is pronounced like English he. The Hebrew word for ‘he’ is pronounced like English who. Now I’ve learned from you that the Maori word for ‘eel’ is tuna, which as you’ve seen is the Spanish word for ‘cactus fruit.’ As for trying those fruits, they’re readily available over here in many Mexican grocery stores, so if you ever come to the United States again, you can have your wish. I do remember Tip Top ice cream. In looking online at packages of that brand, I see they bill themselves as “real ice cream.” I have to wonder: as opposed to what? Would someone be shopping for fake ice cream? Well, okay, there are non-dairy substitutes for ice cream. Maybe they’ve made enough of an inroad into the market that Tip Top wants to stand out as “real” ice cream. Goodness, I think I need some Prickly Pear liqueur to cope with all the word variations. In NZ, real ice cream has to meet certain standards. ‘Since 2002 New Zealand ice cream has been defined under the Joint Australia New Zealand Food Standards Code, administered by Food Standards Australia New Zealand (FSANZ). Ice Cream is defined as a sweet frozen food made from cream or milk products or both, and other foods, generally aerated, and consisting of not less than 100g/kg of milk fat, and not less than 168g/litre of food solids. (Standard 2.5.6)’http://www.nzicecream.org.nz/industry.htm Lots of companies produce frozen confection, so real ice cream makers want to distinguish their products from the cheaper frozen confection. Thanks for providing an explanation. I’m sorry that in return I can’t provide you any Prickly Pear Liqueur. Your mention of liqueur got me wondering how to say ‘tuna’ in French. I tried various translation websites but they kept overriding Spanish with English and giving the French word for a tuna fish. Eventually I found out that French calls the fruit figue de Barbarie, which is to say Barbary fig. Oh well, if English can see the fruit as a pear, French can see it as a fig. Later I found a site that says French also calls the fruit a poire cactus, or cactus pear. 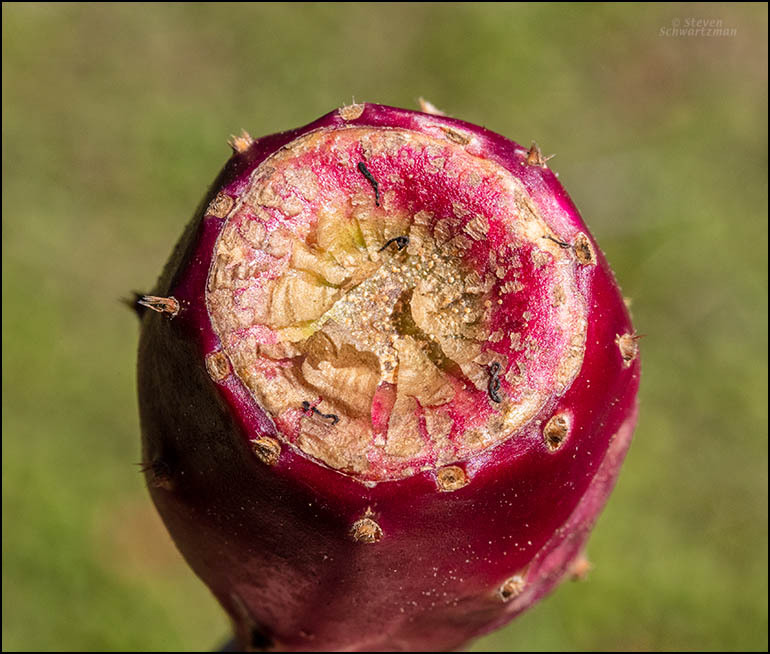 As for the Barbarie, this kind of cactus has been spread from Mexico to many other parts of the world, and my guess is that French-speaking people first encountered it on the Barbary Coast of Africa. I would think that the French would have encountered it prior to it being introduced to other regions like the Barbary Coast. Of course, they could have given it that name just because it does well there. I never gave it any thought. I just thought that everyone except Americans knew it as Tuna. That is how some of the old Italian Americans knew it, although I knew it simply as prickly pear. I’ve noticed that the history of naming offers plenty of cases in which people got confused about where something came from. Two familiar examples are French fries (which didn’t originate in France) and turkeys (which are native to North America, not Turkey). 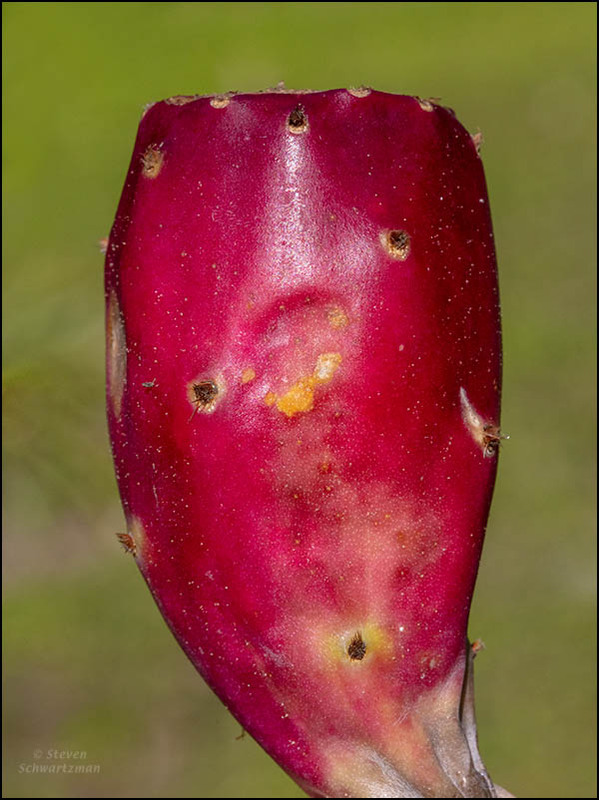 As for the species of prickly pear grown for its tunas, the scientific name is Opuntia ficus-indica, with a species epithet meaning ‘fig from India,’ which is even farther afield from Mexico than the Barbary Coast. We can say that “always” is a relative term. Most interesting. It’s wonder that it is not called an apple. My daughter tells me, and Wiki confirms, that ‘One of the problems identifying apples in religion, mythology and folktales is that as late as the 17th century, the word “apple” was used as a generic term for all (foreign) fruit other than berries, but including nuts. ‘https://en.wikipedia.org/wiki/Apple_(symbolism) I expect that, as with roses, we can confidently say, a tuna by any other name is still a tuna. Maybe growers and especially marketers of tomatoes should go back to calling them love apples. The term “love apple” strikes me as mythical, yet it was real: just three generations back and you found one in your family. How nice. And how strange that people would resist eating it. Maybe the love-apple name suggested a certain sinfulness to the tomato. I was truly surprised to find that the tomato was still ‘foreign’ to parts of New Zealand not so very long ago. Curiouser and curiouser, as Lewis Carroll had Alice say. For sure: no one would want to swallow any glochids. It’s true that this species of cactus grows in the deserts of west Texas, but it’s also quite common in Austin, which is not at all a desert. Now you’ve made me wonder whether anyone has used tunas as Christmas ornaments. Jim Conrad is a fascinating scholar who has studied Mexican plants extensively. Thanks for the links. Given the work involved in gathering tunas and nopalitos, I’m more likely to buy them at one of the Latino grocery stores here. The word tunita as explained in the second article is new to me. As you say, that species is native to Central America and the Caribbean. The native plant database at the Lady Bird Johnson Wildflower Center fails to turn it up anywhere in the United States (though of course people can have planted it). If I saw any when I lived in Honduras, it would have been decades before I’d have paid attention. If I lived there now, I’d certainly pay attention. I never see a photo of a tuna without recalling Greater Tuna and A Tuna Christmas, those wonderful plays about life in the mythical town of Tuna, Texas. I read that Greater Tuna opened in Austin, so you may have seen it; they played the Grand Theater in Galveston, too. I hope no one attended a production expecting to see a play about a fish. I’m grateful to have captured the glochids in my pictures rather than in my skin. Many’s the time it’s been in both. Tuna color does vary quite a bit. Some years ago I described one as ruby, which let me play “ruby tuna” off “Ruby Tuesday.” I’ll join you in calling the color in today’s picture magenta. The plays you mentioned did open in Austin and played here for years. Somehow I never went to see them. I wonder if anyone ever did attend expecting the play to have something to do with a fish. In any case, Tuna would be an excellent name for a Texas town. I have always been fond of this second meaning of “tuna,” ever since I learned of it. Where did you learn it? I have an advantage, having picked it up when I lived in Honduras 50 years ago. No, I knew you wouldn’t have known about it for 50 years. I’m attuneaed to playing with words, so I find nothing fishy about your comment and therefore won’t reply in a prickly way. I noticed the other day that you hadn’t posted since the beginning of November. You reported then that you’d been sick. I hope all is well with you guys now, or at least better, and that you’re looking forward to enjoying a satisfying Christmas. That’s good news. With no more injections there’s no more dejection.